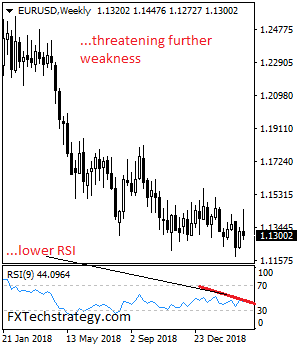 EURUSD expects more weakness on price rejection following its lower close the past week. Support stands at the 1.1250 where a break will turn attention to the 1.1200 level. A break below that level will target the 1.1150 level. Further down, support lies at the 1.1100. Its weekly RSI is bearish and pointing lower suggesting further weakness. On the upside, resistance resides at 1.1350 level with a break through there opening the door for further upside towards the 1.1.1400 level. Further up, resistance comes in at the 1.1450 level where a violation will expose the 1.1500 level. All in all, EURUSD continues to threaten further downside pressure.